When the cornbread is baking, it warms my heart and soul. I love savory, soft, hot and delicious cornbread! The idea of making cornbread video popped into my head. I’ll be honest with Y’all, I want to make easy video recipes in the beginning to practice editing and of course, recording, until I can take the bigger challenge and make more complicated recipes to shoot, meaning, those recipes that take more steps, more ingredients, etc. I just need to get more comfortable, and I hope you will join me when I go on this journey. I promise, it will get better in a short time, I am a fast learner (LOL!). Now, let’s talk about this cornbread. If I tell you that this is one of the best cornbreads that I ever ate, would you believe me? It’s not because I made it, but seriously, it came out AHHmazing! I made it several times this past weekend to check and recheck just to make sure, and this one was ever so soft, moist, light, just a bit heated from chilies and with a little crunch from the fire-roasted corn, which you can probably get in your grocery stores. I mean, my family went bananas, and that’s why I am sharing it with you all today. I tell ya, no more dry cornbread!!! This is from the scratch, savory, delicious and the perfect cornbread recipe that you must try. 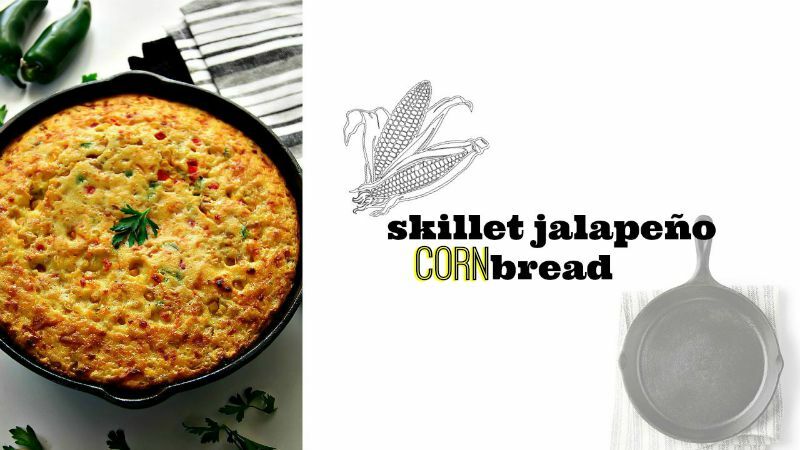 If you want to make the best Southern savory cornbread, then try this recipe! Preheat the oven to 425F (220C). In a large bowl, add 1 cup of all-purpose flour and 1 cup of plain cornmeal -mix it together. Lightly whisk two eggs for a few seconds, then pour about 12 FL oz of milk, out of 16 FL oz. -Mix it. Pour egg and milk mixture into the flour, add 1 and a half teaspoons of salt -mix it very well to combine. Add to the batter, 1 cup of shredded cheddar cheese, then 1 cup of fire roasted corn. Pour remaining milk, and then mix the batter to combine all the ingredients. Add 1/4 cup of oil and mix again. Sprinkle on top of the batter chopped jalapeño pepper, red chili pepper (red hot chili pepper is optional, but it gives an amazing color), and the remaining fire roasted corn. Then, lightly mix the top. Bake it in the preheated oven at 425F (220C) for about 25 minutes. Allow baked cornbread to cool down for around 5 minutes in the skillet. Then take it out on a wooden board. Slice the cornbread into wedges and serve warm.